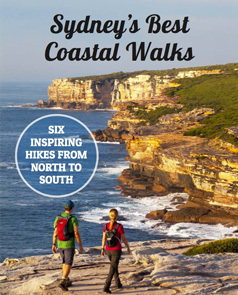 Gordons Bay, Sydney, is Stop 5 on the Bondi to Coogee Walk as marked on the Coogee to Bondi Walk Map. Gordons Bay in Sydney is an underrated swimming location along the Coogee to Bondi walk. If you’re happy to walk down over some rocks, or walk around to where the Underwater Nature Trail starts – Stop 6 on the map – the calm bay is a crystalline oasis. Locals say it’s like swimming on the Mediterranean's Amalfi Coast, and on a calm day when the water glistens like glass, it’s hard to argue. The bay is named after Lewis Gordon, the Government Surveyor who was granted land here in the mid 19th Century. As the state of NSW’s appointed surveyor, he almost certainly selected the land which would be granted to him. Gordon called it Cliff-Brook and when it was sold again in 1859 to local businessman John Thompson, it covered more than 14 acres including the bay itself. Thompson became Mayor of Randwick in 1873 and some people still refer to Gordons Bay as Thompsons Bay or “Thommos”. He built the original Cliff-Brook mansion, a Victorian Italianate-style dwelling built with a mix of rendered brick, sandstone quarried from the site and imported Italian tiles and finishings. You can see a picture of it on a sign as you walk up the stairs on the northern end of the bay, past the fishing club. The “Cliff-Brook” mansion was knocked down and replaced by a more modest home, “Cliffbrook” in 1921, which still stands nearby today. The owner of the new Cliffbrook, Sir Denison Miller, first Governor of the Commonwealth Bank, sold the foreshores of Thompson’s Bay to Randwick Council for 3000 pounds. The wooden framed ramps you can see rising from the beach are called skids and hold aluminium dinghies, or “tinnies”. They belong to members of Gordon's Bay Amateur Fishing Club and are one of the only places you can launch a boat into the ocean in Sydney’s eastern suburbs. The small concrete clubhouse nearby was originally a boatshed and dates from the early 1900s. Although Gordons Bay is relatively protected compared to its neighbouring beaches, these skids and tinnies have been completely destroyed by storm swells as recently as 2015.